After a historic three-day visit to the UAE, Pope Francis reflected on his trip. 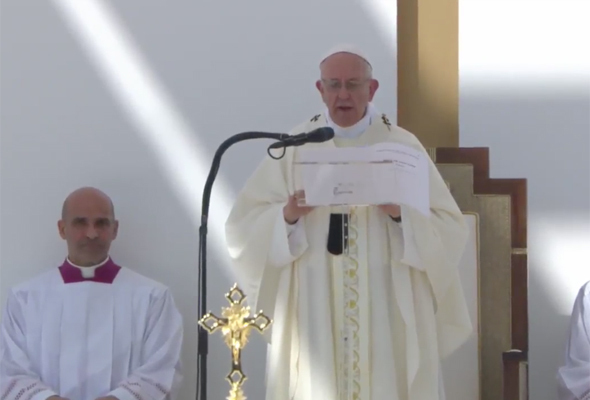 On the flight back to Rome, Pope Francis said that he “saw a modern country,” while in the UAE. “It’s modern and welcoming of so many people,” he added. During the visit, Pope Francis delivered a historic Papal Mass to 180,000 guests at the Zayed Sports Stadium in Abu Dhabi. After arriving on a G-Wagen Popemobile Pope Francis drove around the stadium waving to crowds, before conducting the 90-minute mass which featured readings and Homilies in an array of languages including English, Arabic, Italian, Tagalog, Latin, Korean, Konkani, Malayalam, Urdu and French. The main reason for his visit took place the day prior, when Pope Francis attended an interfaith meeting on Monday February 4. 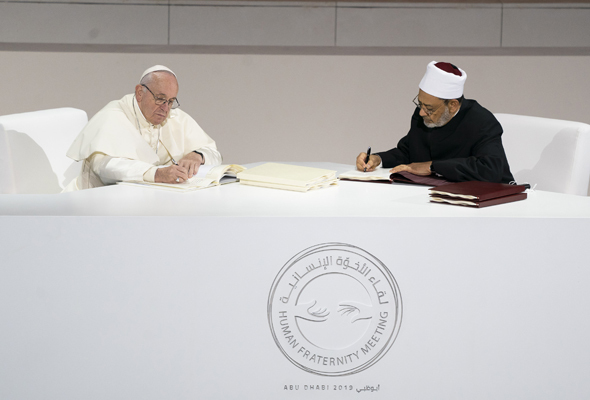 During the meeting, HH Sheikh Mohammed bin Rashid Al Maktoum, Vice President and Prime Minister of the UAE and Ruler of Dubai, and HH Sheikh Mohamed bin Zayed Al Nahyan, Crown Prince of Abu Dhabi attended the signing of a document on ‘Human Fraternity’ by Pope Francis and Dr. Ahmed el-Tayeb, Grand Imam of Al Azhar. The ‘Human Fraternity’ Declaration seeks to build bridges of love, amity and coexistence among peoples and to confront extremism and its negative impacts.The signing was attended by more than 400 religious leaders, as well as thinkers and intellectuals from around the world. 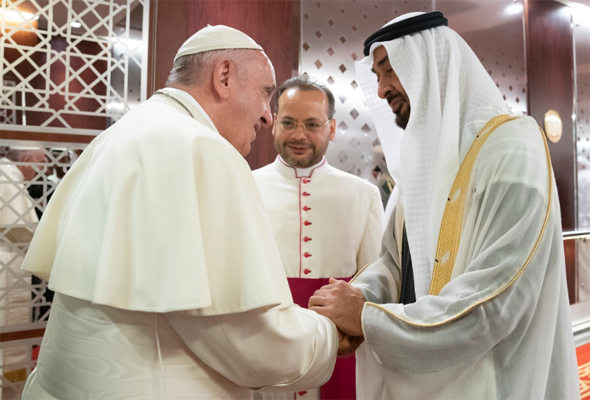 During the occasion, Sheikh Mohammed also announced the launching of a new award, ‘The Human Fraternity Award – Dar Zayed,’ which was jointly bestowed on Pope Francis and the Grand Imam. At the International Interfaith meeting, Pope Francis was also presented with a copy of Celebrating Tolerance written by the Reverend Andy Thompson, MBE. The book is the first of its kind to be published to coincide with the Year of Tolerance, and features a foreword from HE Sheikh Nahayan Mabarak Al Nahayan, UAE Minister of Tolerance, who presented the book to The Pope. The Pontiff also visited the Presidential Palace as well as the Abu Dhabi Grand Mosque.